Do you follow your favorite National Parks on Facebook? You love seeing the beautiful photos, right? That's why I thought it would be cool to use Post Planner's new viral photos finder to find the #1 most shared Facebook photo from 49 different National Park pages. The images are stunning! They include beautiful landscapes, impressive wildlife shots and a few surprises (#39!). Acadia National Park is one of the East Coast's premier parks & is known for its rugged coastlines. Post by Acadia National Park. Arches National Park has thousands of unique rock formations -- including Utah's famous Delicate Arch. Post by Arches National Park. Known for its fruit bats, National Park of American Samoa has coral reefs and rain forests spread over three islands. Post by National Park of American Samoa. Colorful pinnacles and spires dot stark prairie landscapes at Badlands National Park in South Dakota. Post by Badlands National Park. Thousands of species of plants, birds, reptiles and mammals inhabit this area of Texas larger than the state of Rhode Island. Post by Big Bend National Park. Located in southern Florida, Biscayne National Park boasts some of the best scuba diving and snorkeling in the United States. Post by Biscayne National Park. The steep, rugged cliffs at Colorado's Black Canyon of the Gunnison National Park are some of the oldest in the United States. Post by Black Canyon of the Gunnison National Park. Geologic formations called hoodoos are just some of the oddities you'll encounter at Bryce Canyon National Park in Utah. Post by Bryce Canyon National Park. The Colorado River helped carve Canyonlands National Park in Utah's stunning red rock country. Post by Canyonlands National Park. A hidden gem, Capitol Reef National Park in Utah features a plethora of natural bridges and domes. Post by Capitol Reef National Park. Below this rugged country lies almost 120 known caves in New Mexico. Post by Carlsbad Caverns National Park. Channel Islands National Park in California includes five islands and the complex sea environments that surround them. Post by Channel Islands National Park. Crater Lake National Park in Oregon has the deepest lake in the United States. Post by Crater Lake National Park. Rich with native plants and wildlife, Cuyahoga Valley National Park in Ohio provides a beautiful escape from nearby Cleveland and Akron. Post by Cuyahoga Valley National Park. Situated in California and Nevada, this stretch of the Mojave Desert is the hottest national park in the United States. Post by Death Valley National Park. Denali, the highest peak in North America, is in Denali National Park in Alaska. Post by Denali National Park and Preserve. Located in the Florida Keys, Dry Tortugas National Park is known for shipwrecks, sunken treasure and tropical birds. Post by Dry Tortugas National Park. Panthers, crocodiles and manatees are just some of the exotic wildlife you might encounter at Everglades National Park in Florida. Post by Everglades National Park. Situated near the Arctic Circle, Gates of the Arctic National Park doesn't even have roads or trails. Post by Gates of the Arctic National Park and Preserve. Glacier National Park in Montana is spread over two rugged mountain ranges near the Canadian border. Post by Glacier National Park. Fish and wildlife in and around the Alsek River form the heart of Glacier Bay National Park in Alaska. Post by Glacier Bay National Park and Preserve. Arizona's Grand Canyon National Park is one of the Seven Wonders of the World. Post by Grand Canyon National Park. Grand Teton National Park protects the majestic peaks of the Teton Range in Wyoming. 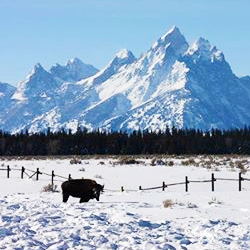 Post by Grand Teton National Park. Nevada's Great Basin National Park is a rugged, mountainous area between the Sierra Nevada Mountains and Wasatch Range. Post by Great Basin National Park. The Appalachian Trail passes through Great Smoky Mountains National Park in Tennessee. Post by Great Smoky Mountains National Park. Great Sand Dunes National Park in Colorado showcases the largest sand dunes in North America. Post by Great Sand Dunes National Park and Preserve. The dormant Haleakala Volcano is the centerpiece of Haleakala National Park in Hawaii. Post by Haleakala National Park. Hawai'i Volcanoes National Park has two active Hawaiian volcanoes: Mauna Loa and Kilauea. Post by Hawai'i Volcanoes National Park. Two massive deserts meet in a special array of wildlife and rock formations at Joshua Tree National Park in California. Post by Joshua Tree National Park. 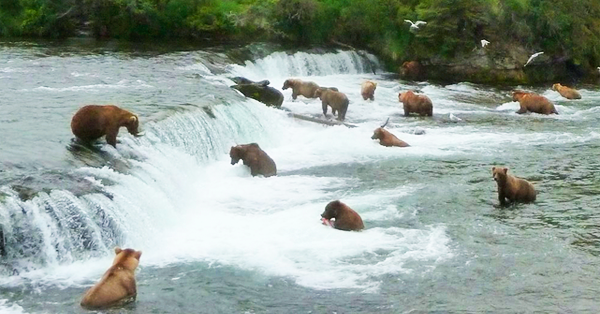 Alaska's Katmai National Park is most famous for its grizzly bears. Post by Katmai National Park & Preserve. Kenai Fjords National Park in Alaska boasts one of the largest icefields in the United States. Post by Kenai Fjords National Park. If you're into dog sledding, migrating caribou or Arctic sand dunes, Alaska's Kobuk Valley National Park is probably for you. Post by Kobuk Valley National Park. Lake Clark National Park is a pristine network of lakes and streams in southwestern Alaska. Post by Lake Clark National Park & Preserve. Mud still boils as volcanic hots springs churn at Lassen Volcanic National Park in California. Colorado's Mesa Verde National Park features thousands of archeological sites and the ruins of hundreds of ancient cliff dwellings. Post by Mesa Verde National Park. The diversity of Olympic National Park features coastline, rain forests and alpine peaks in Washington. Post by Olympic National Park. Known for fossils and large deposits of petrified wood in Arizona, for stargazers, Petrified Forest National Park has some of the nation's darkest skies. Post by Petrified Forest National Park. Spires and rock formations in California's Pinnacles National Park attract hikers and climbers from around the world. Post by Pinnacles National Park. Old-growth forests at Redwood National Park in California contain the world's tallest trees. Post by Redwood National and State Parks (NPS). More than 70 peaks in Colorado's Rocky Mountain National Park are higher than 12,000 feet. Post by Rocky Mountain National Park. A cactus lovers paradise, this park in Arizona got its name from the spiny plant. Post by Saguaro National Park. These parks in California are famous for their giant sequoia trees. Post by Sequoia and Kings Canyon National Parks. Shenandoah National Park protects a beautiful stretch of the Blue Ridge Mountains -- just 75 miles from Washington, D.C.
Post by Shenandoah National Park. Wildlife viewing tops the list of things to do in North Dakota's Theodore Roosevelt National Park, where you'll see bison, elk, prairie dogs, golden eagles and bighorn sheep. Post by Theodore Roosevelt National Park. Check out stunning, underground calcite formations at Wind Cave National Park in South Dakota. Post by Wind Cave National Park. Along with grizzly bear, wolf and caribou, Wrangell-St. Elias National Park in Alaska protects many of the highest peaks in America. Post by Wrangell-St. Elias National Park & Preserve. With historic lodges, diverse wildlife and otherworldly geothermal features, Yellowstone National Park in Wyoming is one of the nation's most beloved natural treasures. Post by Yellowstone National Park. Iconic Half Doom, El Capitan and Yosemite Falls attract visitors from around the world to Yosemite National Park in California. If you get a post card from Utah, it likely has a photo of Zion National Park. Post by Zion National Park. Which of the photos above are your favorites?